He may have meant that you post an issue here? Hello, could anyone give me a little advice or hint on how to proceed further ? I have a LCD display salvaged from a broken laptop (CLAA102NA0ACW) and have got a VGA LVDS controller (R.RM3251 for CLAA102NA0ACW). I'm trying to use the PiView to connect the VGA controller to the Pi and have been having little success. The problem with this is that it goes to 640x480. When I remove hdmi_safe, all I get is a whit bottom line that blinks from time to time. Any ideas of what to try ? hdmi_safe will override your custom setting. CVT modes are not compulsory - my guess is your monitor doesn't support CVT timing. You can explicitly set all the timing parameters (with hdmi_timings), but you will need a datasheet for the LCD to determine what the timings are it requires. from the sounds of it, you're the person to ask about my issue. I've been trying to connect my Rift DK2 to the Pi B+ for a few days now, and have tried almost every possible combination in config.txt. The DK2 is 1080x1920. It's not a rotated 1080p display. It's natively in portrait. Is there any way to get a 9x16 aspect ratio thrown in to the mix for the sake of people trying to use Oculus devices? Mortar Art wrote: from the sounds of it, you're the person to ask about my issue. I've been trying to connect my Rift DK2 to the Pi B+ for a few days now, and have tried almost every possible combination in config.txt. Are you saying you can get an image (e.g. using CVT settings)? If so what problem are you seeing? I assume the pixels are square? On is accompanied by the screen being active. If I leave the Pi's settings alone, and either hotplug or boot with the Rift plugged in, I get Orange/Blue. If I set all manner of settings in config.txt and again via tvservice, I get Orange, if the settings are close to the Rift's needs. Does the Pi support native portrait, or only rotated aspect ratios? Your earlier posts here seem to indicate that it supports 16:9, but not 9:16. - Does hdmi_timings meet the CVT-Standard from VESA? Particulary the Sync-Polarity? If I got right from the VESA standard the sync polarity for normal CRT are HSync - Negative and VSync - Positive. Is this the same for hdmi_timings? - What does the parameter "pixel_rep" mean? The "standard" sync polarities can differ from mode to mode, you have to look at the relevant standard VESA timing sheet. Not entirely clear from the post, but I'm guessing "0" is negative, 1 for "positive." As for pixel_rep: In effect, I think this is telling the display controller whether each pixel needs to be sent twice. The reason for this is that audio in HDMI is sent in-between frames of video and how much audio can be squeezed in is dependent on the pixel clock. As there are some lower resolution modes in HDMI (e.g. 640x480 interlaced like old SDTV), there wouldn't be enough available bandwidth to fit some of the higher-bandwidth compressed audio modes into the stream (e.g. AC3, DTS), so the HDMI spec defines some modes where the pixel clock runs twice as fast, but where each pixel is sent twice, resulting in the same effective video resolution but then the clock runs fast enough to jam the audio in there. has anyone got a 3440x1440 display working? I've got a new LG UltraWide 34UM95 21:9 display and try to get the native resolution 3440x1440 to work with my new PI 2 running openelec 5.x. tvservice -m DMT doesn't display the mode and tvservice -s reports 1920x1080 (I guess selected by KODI out of the available DMT modes). Any suggestions? Is the GPU able to handle such high resolutions at all? Thomason wrote: I've got a new LG UltraWide 34UM95 21:9 display and try to get the native resolution 3440x1440 to work with my new PI 2 running openelec 5.x. and it will probably show up, but I suspect that it is way too high to be usable. [email protected] is the most we officially support. You should probably read this thread for ideas. But realistically the higher resolutions are only likely to be usable for X/framebuffer uses. The hardware blocks (H.264, 3D, ISP) are just not designed for more than 1080p. will try this when back from work. In the ends more about the aspect ratio 21:9 as 16:9 movies look pretty distorted. If I can't get it working, I will probably look for a resolution close to 1080p but closer to 21:9. If tried the 3440x1440 with the higher hdmi_pixel_freq_limit as well as hvs_priority set to 0x32ff -> without success. tvservice -m DMT and tvservice -s are displaying the mode as expected but the kodi screen stays black without reporting any errors in the logs. Good to hear. Are you using this resolution with OpenELEC without issues? Seems so, tvservice reports the correct resolution and KODI offers that resolution in the video settings. If quickly tested some 1080p videos and didn't see any tethering or frame drops. Youtube with 720p is running for over an hour now. Seems to be perfectly fine. BTW I'm using OpenELEC 5.0.5 and KODI 14.2beta. 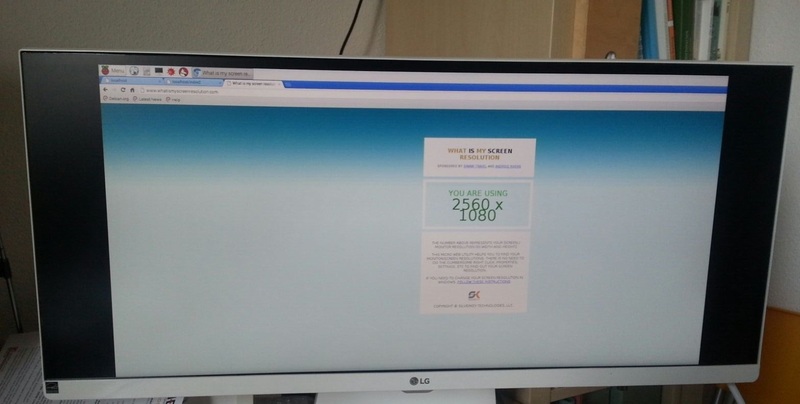 I have an LG 25UM55 with a native 2560x1080 (4^3 : 3^3 aspect ratio, clearly an advance over 4:3 and 4^2 : 3^2). I'm running raspbian with the latest updates, including firmware, on a Pi B2. I have only been able to get it up to 2160x1080. I don't even know where the 2160 number comes from. My config.txt is similar to yours. The output of edid parser isn't clear to me. But it looks like it likes the new mode, but ends up with CEA 16 ([email protected]). Although it appears nowhere, 2160x1080 is actually used. Thanks a lot I used your config.txt file with my LG29UM65 and a Rpi2 using Openelec 5.95.1 and it works just perfectly at 2560x1080 !! For all hdmi_mode values > 4 on hdmi_group=2 I get blinking red lines where it should be black screen. i.e for hdmi_mode=51 I get the whole black areas filled with blinking red horizontal lines. I have also a LG Electronics 29UM65-W, 29"
i was able to get a 2560x1080 resolution but i have huge black bars left and rigth and the screen is not centered. I am able to move the mouse "behind" the right black bar. with overscan settings i was only able move the picture to the left or rigth. but if i use a negative value for overscan_left the screen stays black but tells me its getting a signal. i will never know why but max_framebuffer_height was the problem. Yes! Thank you for the config, now I also have the display working on my LG ultra wide. Has there been any advances on this topic? I need a Pi 2 to output to square display of 1600x1600. Does anyone has any experience with 32:9 (1920*540) monitor running on pi 2? I'm trying to build a digital signage system and this monitor seems to be what I need. How do you find values for the hdmi_timings parameters?